Has It Been Ages Since Your Last Dental Checkup? Dental checkups and cleanings may not seem like much. In fact, for many people, these visits have been somewhat dreadful. We are all encouraged to obtain professional dental exams and cleanings every six months. During childhood, this is often the norm. However, once free to make their own choices, many people let those routine visits slip on by. We’re going to assume that, even if you are one of those people who has let dental care slide, you know the problems that could arise. There is no benefit to lecturing on the virtues of good dental care. This is something you know. So, what we do want to discuss here is what you’ve been missing by staying away from the dentist. 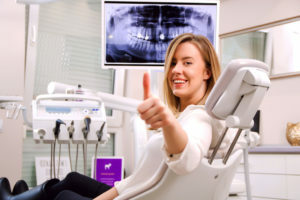 Dental technology may be a rather boring topic for most people, but we want to suggest that knowing how dentistry has changed may interest you. You may be interested in these changes because they offer substantial benefit to your experience in the dental office and throughout your life. One of the advances that we want to mention straight-away is the use of dental sedation for various dental procedures. Patients who visit our Warrensburg, Oak Grove or Windsor office can leave stress and anxiety at the door thanks to the availability of nitrous oxide. This fast-acting sedative has been used for over a century and has been proven safe and effective for mild to moderate levels of dental anxiety. So, if your reason for missing dental appointments has anything to do with fear, we’d love to speak with you about the benefits of nitrous oxide. Sedation isn’t the only advancement that is worth noting. Diagnostic screenings have also improved. For example, cavity detection is now aided by both intraoral cameras and by laser cavity-finding technology. It is easy to say that improved oral health is the primary benefit of seeing the dentist regularly. However, we propose that there are also massive psychological benefits. When you see the dentist every six months, you have a much better idea of what to expect than if you let even a year go by in between visits. The degree to which this reduces stress is significant. The more you go, the more you know; and knowing your smile can bring a lifetime of reward. Learn more about your oral health and our commitment to personal care. Call an office near you to schedule your checkup.